Our elders always say that you should not take the baby outside so often. There are many reasons for that. But with the new technologies available in the baby products going on a trip has become easier. You would have heard about the mattress toppers that can be used on top of any mattress which is very helpful while travelling. But all those were one-sided which means you use the same side for both infants and toddler. You use the same side of the mattress or mattress topper for a long time. But the Dream On Me 2-In-1 breathable two-sided portable crib mattress is not like that. Let us discuss that in this Dream On Me 2-In-1 breathable two-sided portable crib mattress review. In this mattress, one side is designed for infants and the other side is designed for toddlers. The main advantage with this two-sided mattress is that once your baby starts to walk you can use the other side of the mattress which is fresh and clean. The toddler side is covered using a waterproof material which keeps it clean and germs free. The infant side will be covered using a breathe-flow material to give the much-needed ventilation. Both infant and toddler sides are covered using Hypo-allergenic layers so that mold, bacteria, and other allergens do not enter the mattress. 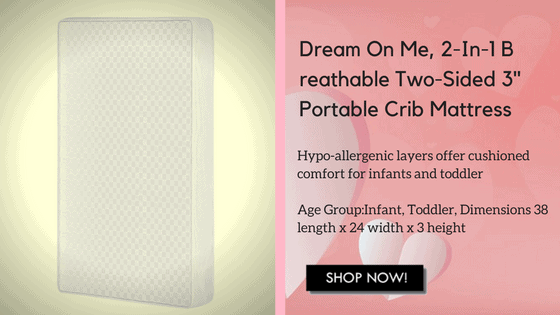 This Dream On Me 2-In-1 breathable two-sided portable crib mattress is designed to give your little one a comfortable night’s sleep. This is achieved by using interwoven steel coil inside the hypo-allergenic cover. There are benefits from this design. One is that the mattress will not sag and the cover will give the comfort to the baby while sleeping. We all know that babies need more sleep than adults so comfort is very important. 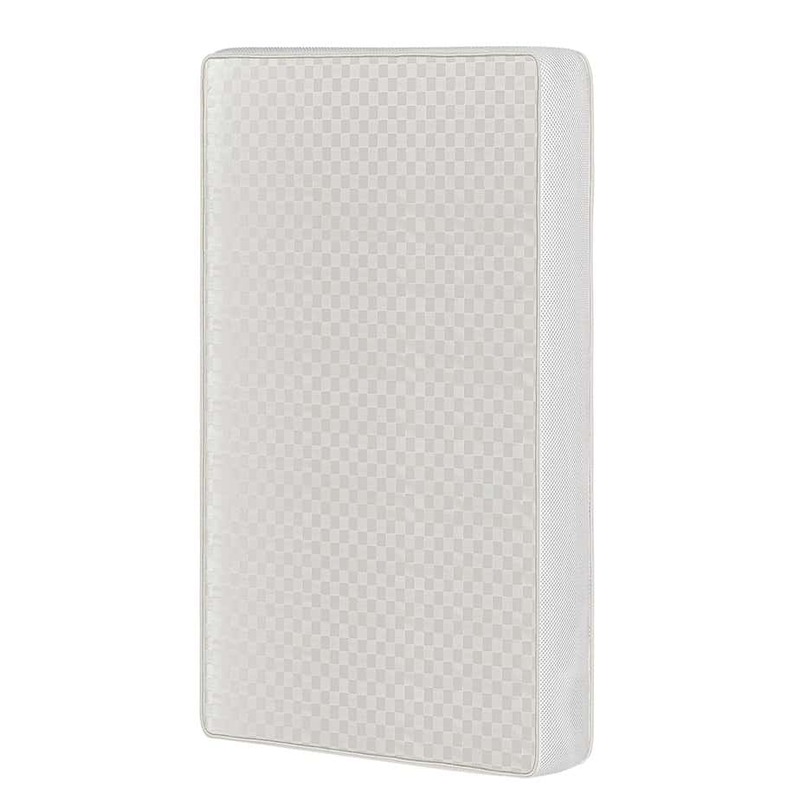 The dimensions of the Dream On Me 2-In-1 breathable two-sided portable crib mattress is 37.5 x 24 inches. The mattress weighs 2.5 pounds making it portable. This mattress has a thickness of 3 inches and is made of breathable fabric covered using a vinyl cover. The mattress is phthalate and lead free which is tested and certified. The mattress is certified by 16 CFR 1632 /1633 Federal Flammability Standards, CertiPUR-US, and ASTM Standards. In this, the CertiPUR-US is especially for the outer layer that gives the needed comfort to your little one. This waterproof cover makes the cleaning process easy. While ordering this from the online websites make sure that you are ordering the right size mattress that fits with your baby’s sleep furniture. The Lock-stitched binding at the edges of the Dream On Me 2-In-1 breathable two-sided portable crib mattress makes it safer so that the edges will not unravel which can cause serious health and safety issues to your baby. The last point you should know In this Dream On Me 2-In-1 breathable two-sided portable crib mattress review is that sometimes you may find this mattress bit smaller than the crib since it is made portable.